Below is list of popular sites which offer free SMS service in India. Send Free SMS to your contacts. Get free SMS updates from people and friends. But you have to register at ibibo. Using this site you can send Free SMS to any mobile in India, Kuwait, UAE, Saudi, Singapore, Philippines & Malaysia. way2sms: Its is another most used free SMS website in India. 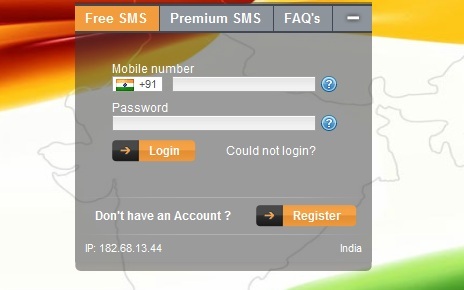 You can Send Free SMS to any Mobile network in India. You can also get email alerts for your gmail, yahoo accounts. Another great feature of the site is that you can Chat with your GTalk and Yahoo contacts. The site let you send Free SMS to any Mobile in India. You can Schedule Free SMS for Future dates. You can also Send Free group SMS. With free SMS the site also offer Chat, Games, Movies & Music. Another sites to send free SMS in India. Send Free SMS to any Mobile network in India. You can also chat with other members of the site. Another good website to send free SMS in India. Its a very good site to send free SMS. You do not need to register / login to send SMS. Just visit the page and send free SMS to any number in India. Another site using which you can send free SMS and also free MMS. No login / account is required. Service is also fast. 150 free sms daily, 470 characters, No advertisements. You can Schedule sms. Also have online Phonebook to save contacts. The site also has huge SMS collection. Send Free Sms To Any Mobile In India Easy sending, coupled with exceptional delivery speed With Free Email Alert’s On Mobile has made Site2SMS highly popular. Good site with less ads and modern interface.